Americans are expected to spend US$14.8 billion as they watch the New England Patriots take on the Los Angeles Rams in the Super Bowl on Sunday, a survey showed. 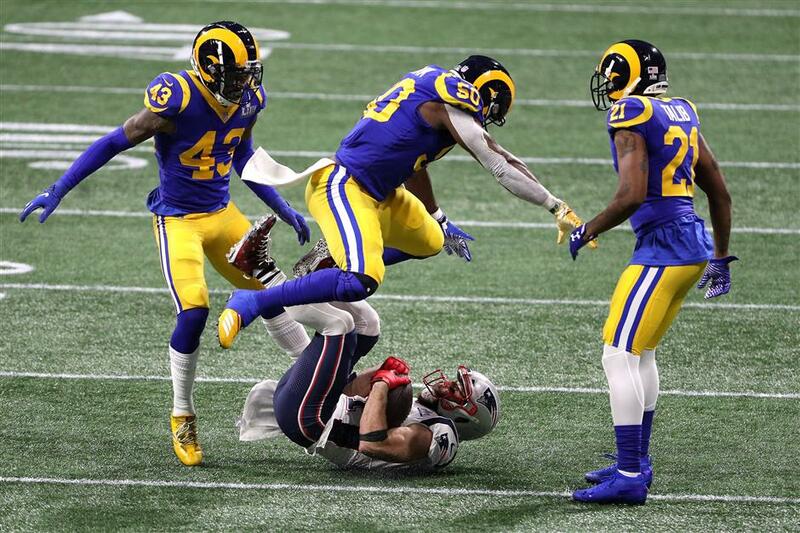 Julian Edelman #11 of the New England Patriots dives for extra yards against Samson Ebukam #50 of the Los Angeles Rams in the first quarter during Super Bowl LIII at Mercedes-Benz Stadium on February 03, 2019 in Atlanta, Georgia. According to the latest annual survey released by the National Retail Federation and Prosper Insights & Analytics, about 182.5 million American adults plan to watch this year's National Football League championship game, and each of them is expected to spend 81.3 dollars on average. The biggest spenders will be those who are between 35 and 44 years old, as they are willing to spend an average of USS$94.89, followed by the western part at US$84.01, said the survey. According to the survey, about 61 million people who plan to watch the game will attend a party, 44 million people will throw a party while 13 million people will watch it in a bar or restaurant. About 43 percent of those who plan to watch the game said the game is the most important part of the event, but 23 percent of the people cite the commercials. Another 14 percent of the people consider getting together with friends more important while 13 percent of the people are looking forward to the halftime show. "The numbers vary from year to year, but regardless of the economy, politics or the weather, most Americans manage to take a break every year for the Super Bowl," Phil Rist, vice president of strategy at Prosper Insights & Analytics, said in a statement. He added that "the big game is a day for big spending regardless of who plays or wins." The survey of 7,384 adults aged 18 and older was conducted between January 2 and January 9, before people knew what teams would play.